My latest chalkboard project. I had a picture frame decal I wasn't sure what to do with. 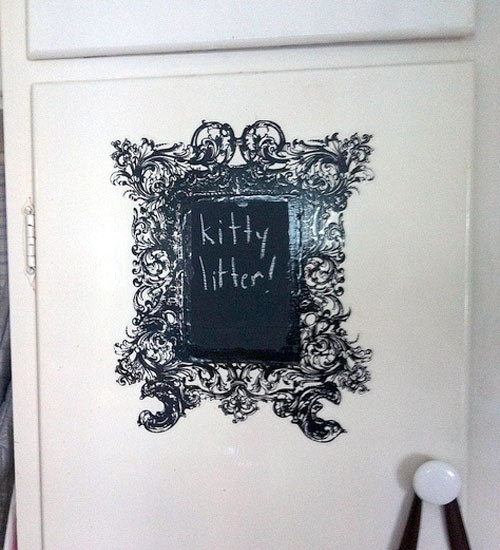 So I painted a square of chalkboard paint on one of my kitchen cupboards then put the decal over it. It's a little spot where I can write shopping list notes. Do you use chalk or a chalk pen? I bought some pens but was disappointed that only the white seems to look nice. I'm just using good old fashioned chalk. Haven't tried chalk pens. Might have to get one.